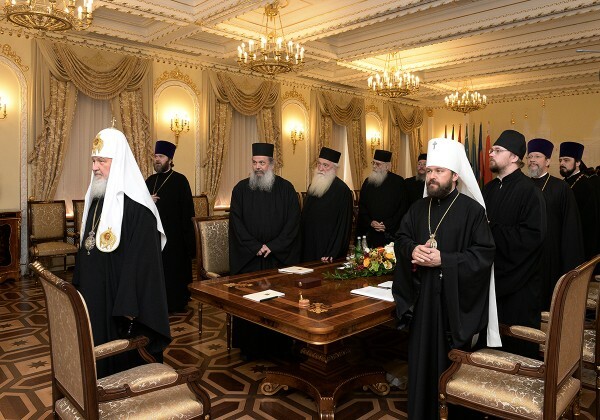 On 17 June 2015, His Holiness Patriarch Kirill of Moscow and All Russia met with the members of the Commission on preparation for the 1000th anniversary of the Russian monasticism on the Holy Mountain of Athos. Taking part in the meeting that was held at the Patriarchal and Synodal resident in St. Daniel’s Monastery were Metropolitan Hilarion of Volokolamsk, chairman of the Moscow Patriarchate’s Department for External Church Relations (DECR); archpriest Nikolai Balashov, DECR vice-chairman; archpriest Igor Yakimchuk, DECR secretary for inter-Orthodox relations; and Rev. Mikhail Asmus, a DECR consultant. ‘We are approaching a date very important for the Russian Orthodox Church and the whole Orthodoxy – the 1000th anniversary of Russian monasticism on the Holy Mountain, and I am happy to discuss the issues pertaining to the preparation for the celebration. ‘The relations between Rus’ and Mt. Athos have begun after the Baptism of Rus’ in 988 and continued through many centuries. Testifying to this are the holy relics brought to Rus’ by our pious ancestors and monks from Mt. Athos as well as many treasures from Russia donated to Mt. Athos. ‘Russia has always defended Orthodoxy in the East thus largely ensuring the security of the Holy Mountain, which has largely ensured the spiritual security of Russia, by its influence on Russian monasticism in particular. While celebrating the 1000th anniversary of Russian monasticism on Mt. Athos, we would like to ponder over the history and introduce the younger generation of the Russians, Ukrainians, Byelorussians and representatives of other nationalities to it, to show the importance of the Holy Mountain to our society and spiritual life of our country. We would like this celebration to draw attention to Mt. Athos all over the world, we would like Europe to think anew of the importance of the Holy Mountain for the spiritual life of the Europeans. ‘I believe that this is especially important as the religious life in Western Europe is declining while the dangerous anti-Christian ideas are becoming a foundation of society. We can say that the Western world is experiencing a deep spiritual crisis. The West does not comprehend it and looks at the whole world with arrogance and demands that everyone should adhere to its laws in which there is no place for God and faith in people’s life. That is why I think that that the celebration must be carried in such a way that not only Russia and Greece can feel the importance of the spiritual tradition of Orthodoxy but the entire world, too. The example of Russia, a powerful modern state, which plays an important part in international relations and at the same time lives on the energy of Mt. Athos, can be a convincing example for many Europeans, including those disagreeing with the dangerous anti-religious and anti-Christian trends in the life of Western Europe and North America. ‘We are developing a wide-ranging programme of the celebration in the Russian Orthodox Church. We will hold the meetings of monks, realize special programs in theological seminaries and some publication projects. Scholarly conferences will take place, TV programs and films will be shown, the All-Russian school competition on Mt. Athos will be held. Also, the program of the church and state jubilee celebration is being developed. We would like to use this date for deep tilling of the religious soil. Representatives of the Holy Kinot thanked His Holiness for meeting them and noted that monks on Mt. Athos highly appreciate the centuries-long relations with Russia and try to do anything possible for their strengthening and development. Various issues pertaining to the preparation for the jubilee celebrations planned for 2016 were discussed.